*This upgrade is meant for aftermarket front swaybars since most swaybar kits only come with rear urethane bushings and re-use the factory front ones. Almost all aftermarket swaybars as well as the TL-S front sway bar runs 27mm in diameter. The urethane bushings allow the upgraded swaybars to perform their job better. Although the kit comes with new brackets, you won’t be using them due to the shape of the mounting location. 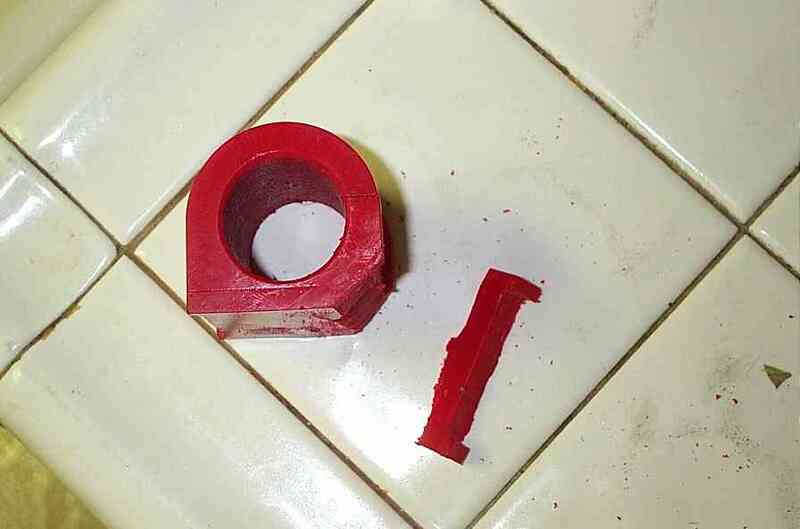 The new urethane bushings will need to be cut on one of the edges to allow better fitment. Parts needed: Prothane part #85-97830, or Energy suspension swaybar bushings for a 1 1/16″ bar. Step1: You can drive up a ramp, or jack the front of the vehicle up on jack stands. Make sure you choke the rear wheels. I can never express enough the importance of safety especially when you’re working on a mass of steel that weighs over 3000 lbs!!! Step2: Unbolt both swaybar brackets. 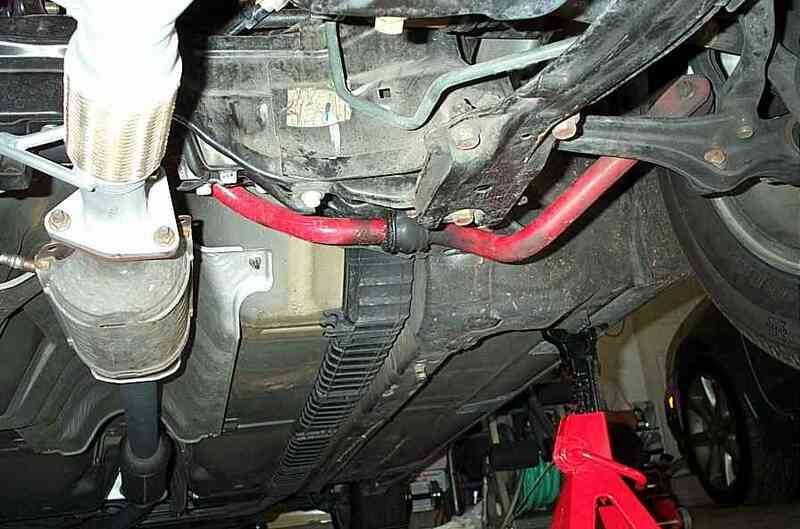 As you’re removing the last bolt, make sure you hold the swaybar with one hand or else it’ll swing down and scare the sh*t out of you when it bangs against the downpipe. Uhh.. no.. it didn’t happen to me. 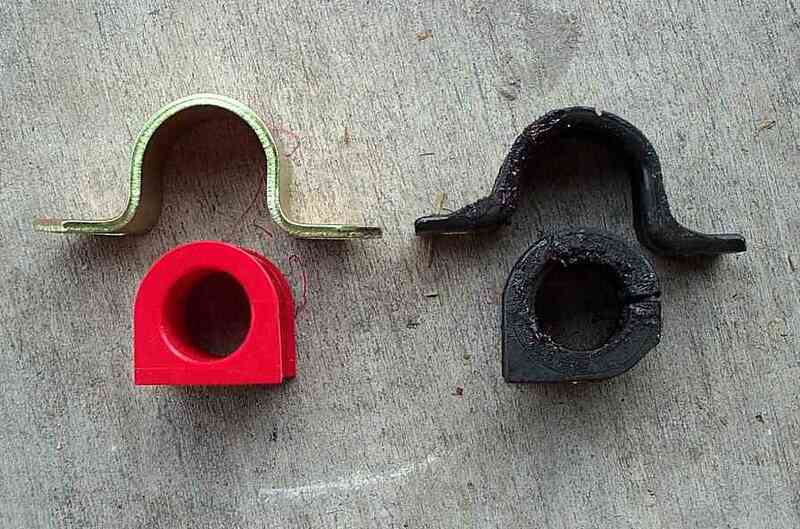 Step3: Lay the factory rubber bushing next to the new urethane one and compare them. You’ll notice that the factory one is curved on one edge. You’ll have to cut a portion of the urethane one to match the factory one using a hacksaw. Step4: I tossed the silicone grease that came with the bushing. I found teflon tape to work just as good, if not better, and lasts much longer. Follow the directions in the ‘Swaybar bushing lube’ guide. Step5: Re-install the bushing in reverse order. The bracket bolts should only be torqued to 16-18 ft. lbs. Don’t over tighten.